We’ve all read at least something about welcoming wildlife in the garden. Providing suitable habitat—including food, water, and shelter—is essential. Sometime the habitat that wildlife chooses isn’t quite what you would expect, though. My current case-in-point is the rather large toad that has been living on our deck all summer long. 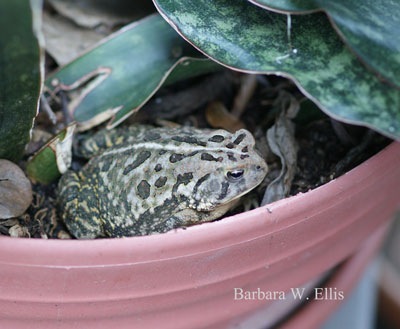 Above: A potted Pyrrosia fern summering on a deck doesn’t seem to offer much in the way of wildlife habitat, but evidently toads think otherwise! At first glance, a deck doesn’t seem like a great spot for a toad to set up residence, especially one that is the main route four dogs take to and from the back yard several times a day. Still, “our” toad seems happy there. Food doesn’t seem to be a problem, since he or she seems to be able to find plenty to eat—especially in the evening when the lights in the living room or out on the deck are on and are attract night-flying insects. Shelter is another story. I wondered what our resident toad did during the day and in very hot weather, since toads normally spend the daytime in cool, moist soil, either under logs or debris or in burrows. During hot, dry weather they can aestivate, meaning they spend the hot summer days in a dormant state, in burrows or similar locations. As it turns out, houseplant containers provide perfect shelter. Above: A potted sansevieria is the perfect spot for summertime snoozes, thank you very much, as the photo above illustrates. Toads also are quite a bit more physically able than one might expect. In order to get up onto the deck, “our” toad had to hop up either four steps on one end of the deck or three on the other. I’ve known for some time that toads could hop up steps—we had them on our deck in Pennsylvania—but still it never ceases to amaze me. In addition, though, our current deck-dweller climbs up into a plant pot each morning for a daytime snooze, then re-emerges in the evening. 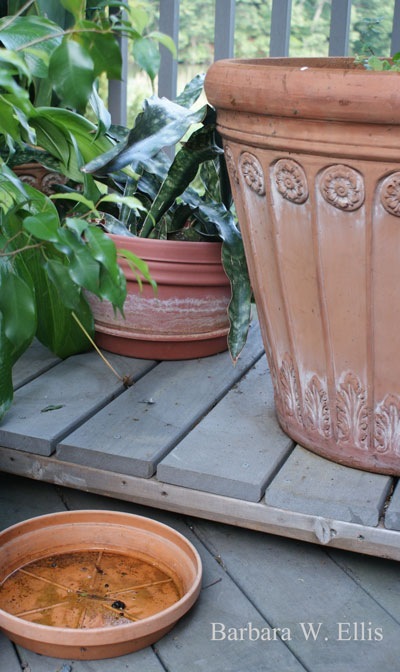 While I doubt one could manage to climb up into a standard pot, I have a couple of houseplants that are potted in shorter azalea pots. “Our” toad seems to spend a day or two in one of the pots before switching to the other. Perhaps he or she enjoys having a chance of scenery. Above: Shorter pots are an easy climb for a full-size toad. 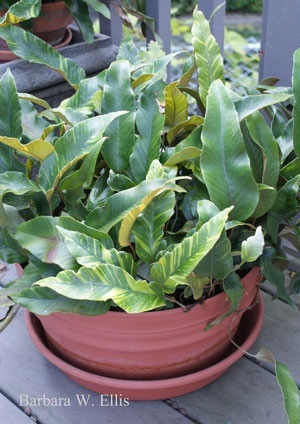 Ours routinely climbs into two different pots, one that is 7½ inches tall and the other is 8½ inches. Plus, he or she climbs up onto the 5½ inch tall dolly the pots rest on. “Our” toad spends more than half its time snoozing in the pot in the center of this photo. The plant saucer in the foreground—filled immediately after this picture was taken—provides a reliable source of water. When the summer comes to a close and it’s time to bring houseplants back indoors, I’ll move our houseguest down into the garden. I just need to make sure I help him or her make the move early enough to dig a wintertime burrow.